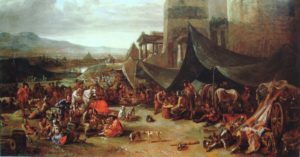 Ancient Roman Stories: In the legends, early Rome was a glorified pirates’ camp. Because there was a shortage of women in Rome, the Romans stole some from the Sabines. Not especially interested in farming or learning a trade, they adopted the hobby of conquering their neighbors and soon made it an art. 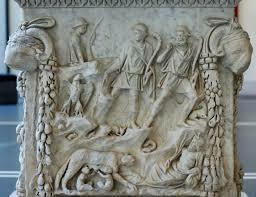 The ancient Romans loved to hear the story of Romulus and Remus. In their eyes, this story explained why Rome had the right to rule. 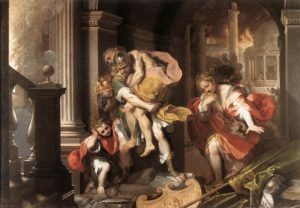 According to the legend, Romulus and Remus justified their right to rule because their mother was a princess and their father was the war god Mars. Romulus was the first king who ruled Rome. He was followed by Numa Pompilius, who made by inspiration of the gods the forms for Rome’s cults and priesthoods, its auguries and its College of Vestals. Tullius Hostilius, the next king, made Rome ruler of all Latium, and Ancus Martius founded the port of Ostia. The next king, Tarquinius Priscus, was an Etruscan, and probably gained his throne thanks to a conquest by one of the great Etruscan city-states. Tarquin made a city of Rome, by building the first real temples, the Cloaca Maxima or Great Drain, and the first Circus Maximus. After a series of wars and defeats, by 270 BC, Rome had eliminated all its rivals to become master of Italy. It had taken about 200 years, and in the next 200 Roman rule would be established from Spain to Egypt. The first stage had proved more difficult. In Rome’s final victory over the other Italians, the city digested its rivals; whole cities and tribes simply disappeared, their peoples joining the mushrooming population of Rome. After 270 it was much the same story but on a wider scale. In the three Punic Wars against Carthage (264-146 BC), Rome gained almost all the western Mediterranean. 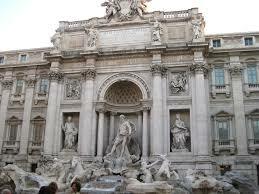 Rome’s history was now the history of the western world. The Parentalia and the Lemuria. 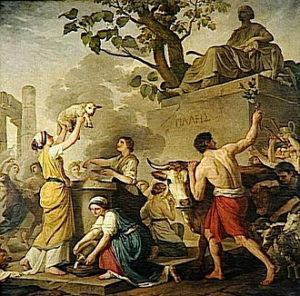 The Parentalia refers to a period that began on February 13 (which is our equivalent date) and lasted at least ten days, during which business basically shut down-temples were closed for the festival, no fires burned on any altars, no marriages were contracted, and so on. The name of this festival indicates that this was a period to commemorate dead kinfolk, though the rituals of the Parentalia were conducted at the grave site and not at the family home. The Roman writer Pliny the Younger, who was well regarded by his contemporaries, recorded several ghost Roman stories but does not seem to have held any strong specific religious beliefs about an afterlife. The Romans worshiped thousands of gods. As they expanded their empire, they discovered new gods along the way, gods worshiped by other cultures. When they ran into a god that sounded interesting, they adopted it. They gave all their adopted god’s Roman names and acted as if they were Roman gods all along. There were various stories associated with various Roman gods.